Badger Meter offer a hugely varied and world renowned selection of flow measurement products. As you are probably aware, we are the UK representative for Badger Meter and we supply a whole host of their products. Last month we were invited along to Germany for their two day product training event being held at Badger Meter Europa in Neuffen. Over the course of two days training we covered a range of their industrial flow meter products such as: Hedland VA meters, turbines, oval gear, nutating disc, Coriolis, vortex, differential pressure and impeller flow meters. As well as learning more about Badger Meter products, we also sampled German cuisine, Swabian noodles, being the dish of choice. 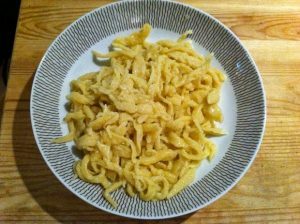 Swabian noodles, also known as ‘Sptzle’ are a local delicacy made from a soft textured egg noodle. The total estimated annual commercial production of Sptzle in Germany is approximately 40,000 tons. We think they like it, there were however mixed reviews from the Bell Flow team. This entry was posted in Flow Meters on 8th July 2014 by Ella Garfield.